Sasha Banks was not backstage on Monday Night Raw following reports she requested her release, refused to turn up to WWE events and wants nothing more to do with the company. Now it seems WWE is either turning the real-life event into a storyline, or it's been a storyline all along. 'The Boss 'N' Hug Connection' were the inaugural WWE Women's Tag Team Champions after winning an Elimination Chamber match. It was reported that Bayley and Sasha Banks were supposed to have lengthy runs with the titles they helped introduce but at WrestleMania 35 they lost them to the IIconics. This spurred on what online reports allege to be a major backstage incident involving an unhappy Sasha Banks which ultimately led to 'The Boss' asking WWE for her release. A request that is believed to have not been granted. So, WWE seems to be playing into the massive reaction these reports surrounding Sasha Banks and her future with the company received by releasing the following backstage video. 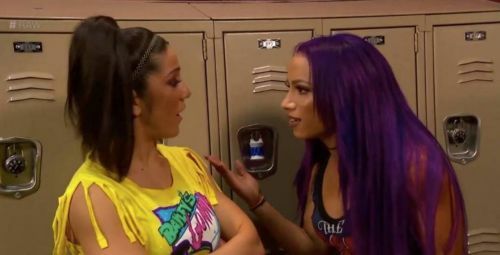 In the video, Bayley can't get hold of Sasha Banks and the IIconics mock her, eventually leading to Bayley challenging them and saying she'll find another partner. Now, if Sasha Banks has indeed gotten upset with her creative direction and asked to be released from the company, then this shoot storyline is an incredible move from WWE for a number of reasons. However, I am starting to get the distinct impression that maybe, just maybe, the internet wrestling community and wrestling journalists have been worked on this one. If it's a work it's also an extremely smart work that has fooled everyone hook, line and sinker with the WWE Universe waiting patiently to see where this story goes and where Sasha Banks ends up. Do you think the Sasha Bank story is true? Leave your thoughts in the comments section below?